If your branch is sending bad marketing with bad copy, you’ll be missing out on valuations. That may seem like a tough opening but in today’s saturated property sales market, estate agents are all vying for the same streets that you are, they’re writing to the same homeowners you are and they’re all attempting to win over your customers. Thankfully, there’s a few key mistakes that can be avoided and set you on the road of writing the perfect estate agent sales letter. Never ever talk down the competition (especially in your marketing). I know, you’ve heard the horror stories from their customers, you’re confident they won’t put in the effort that you will, and you’ve maybe even got your own fun nicknames for them. It might be fun around the office but it’s uncomfortable for your customers (remember they chose them to market the property the first time around so undermining the competition also undermines their decision). Cut these sleazy phrases out of your letters and emails. Tone and language is too important. So it’s astounding to see agents sending marketing letters that sound cocky instead of confident, hotshot instead of humble and pushy instead of pleasant. Ask someone (outside your office) to read your letter and give you 3 words to describe the personality of the person writing it. If their response is anything other than warm and friendly, you might be losing valuations unnecessarily. Sending a letter or postcard with big and bold writing doesn’t make someone read it more. Least of all if it’s in capitals. Are you trying to send debt demand letters or we’re-friendly-local-agents-here-to-help letters? Writing in capitals just makes people wonder why they’re being shouted at (in writing) by a company that’s clearly trying to sell to them. The only time we buy from someone shouting at us is when we buy fruit and veg from a market stall trader. “Pound a bag o’ ban-aanas”. And you, my friend, are not a market trader, you’re a professional. Let’s get low-low-lowercase. How many times have you looked at reviews online before making a purchase? Chances are, more and more. People trust what other people say about us more than they trust what we say about us. If you have a happy customer get in the habit of asking them to write a review. Whether you fixed a light in one of your rentals or sold a house that only Zig Ziglar could have sold, ask for it. Now you’ve got your reviews, share them. Everywhere. Quote them on every single letter, on every piece of marketing material, on sales memos, email footers. Everywhere. See those stars? Gold stars instantly makes us feel like we’re getting a good service. Get them on there (but don’t go tacky). There’s a few that fall into this category. Spelling errors, grammar, typos, bad mail merged addresses and the ultimate… sending letters to deceased people. It happens (and we know by accident) but sending that letter makes your branch look like hawks. Get your data cleaned up before you post. Spending a few pennies on removing deceased contacts will save you a lot more in damaged reputation and since you can get free audit of your data, there’s really no excuse. Everyone likes to feel like they’re getting a good deal but somehow this sentiment seems to bypass the property buying industry. Like when homeowners are offered a “free” valuation. Sellers expect a “free” valuation, how else are you going to sell my property otherwise? It’s no different to owning a cafe and advertising in the window that people can come in for free to look at the menu. Of course I can. By all means, tell people there isn’t a charge but don’t promote it as a special offer. Don’t just tell potential sellers that you’ve noticed their property has been on the market for longer than it should and that it might be time they evaluate their agent. Be specific about what you do and how you want them to respond. If they don’t know how to respond, they probably won’t. No one likes reading just text on paper or an email, it’s boring and non compelling. The right use of images can make or break your mailing. The first rule of choosing one is that it should be made based on the emotions the image makes you feel rather than the action or what you do. A good example: An image of a happy couple moving out rather than a picture of a sold sign (or nothing at all). Doesn’t that make you feel all warm and cuddly? Pay close attention to what leaves your door when it comes to marketing. Applaud your agents for taking initiative but make sure that it isn’t damaging your chances of winning valuations. After all, it only takes another local agent to give your prospect the honesty and respect they’re looking for, to win them away. 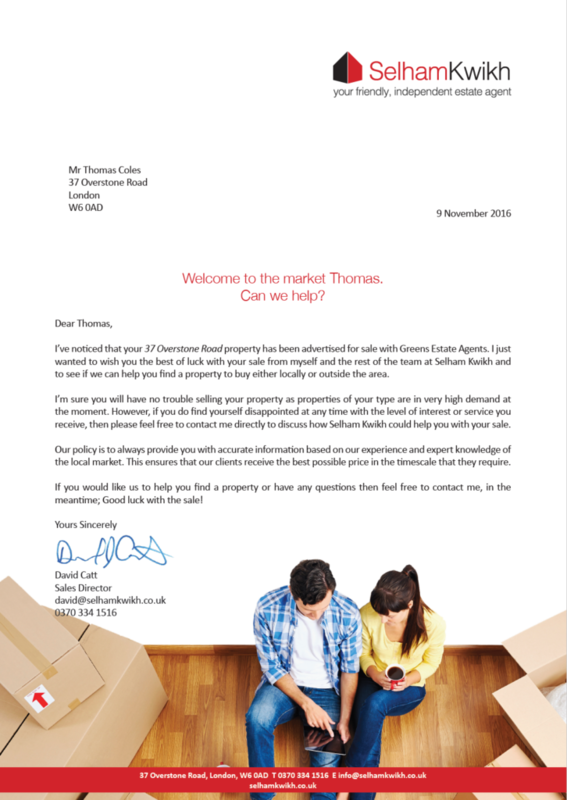 To find out more about how we take the stress out of sending letters for agents click here. Send your touting letters online!